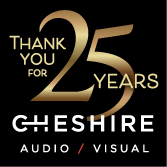 At Cheshire we are constantly challenging ourselves to push our technical knowledge for our customers. We keep up to date with the latest technology so you don’t have to. We invest heavily in our inventory for large scale productions. This allows use to offer this technology to the rental market at prices that fit every budget.